After a long, chilly train ride, we arrived in Delhi last Thursday. 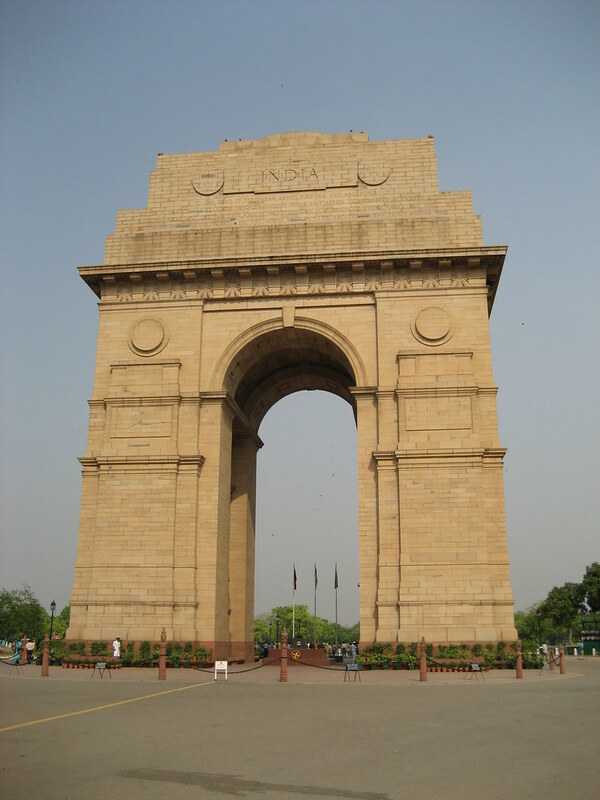 Delhi is India’s second largest city after Mumbai. And though I can not find consistent population numbers, it is a fact that several million fewer people live here than in Mumbai. What’s more, several million fewer people live in a much larger geographic area here in Delhi. The result: a city that we can manage – most of the time. Still, this is Delhi and we are in India. It’s a city that manages to be modern and ancient at the same time. Strolling around Connaught Place on our first evening, we had a choice of many fine dining establishments to choose from – as well as Pizza Hut, McDonald’s, KFC and TGIFriday’s, Subway, Ruby Tuesday’s and Domino’s. Few people pestered us to “visit my shop” or tried to swindle rupees out of us. We grabbed treats from Wenger’s bakery and sat peacefully among the Indian couples and families watching the fountains in the park in the center of Connaught Place. I can deal with this, but then this wouldn’t really be India. Don’t fret. We’re staying right in the middle of the real fray in the Main Bazaar of Paharganj. It’s Delhi’s backpacker ghetto. You can find pretty decent budget accommodation and good internet connections. You can even drink a so so coffee and eat a cheese bagel (also so so, but still a treat). Aside from the refuge of our room, the internet cafes, and a few decent eateries, I find the rest of Paharganj verging on intolerable – increasingly so after several days here. The narrow road of the Main Bazaar is jam packed with shops (mostly catering to foreigners), street vendors, trash grazing cows and the holy presents they leave behind, starving Delhi dogs, cycle and motor rickshaws trying to take you for a ride (more on that later) and swerving, horn honking motorcycles and cars. It’s absolutely imperative that you keep an eye on your toes at all times so that they don’t get stepped on, run over or doused with foul smelling fluids. But Paharganj is just one little corner of Delhi. Delhi is in fact quite large and its sites are spread about making some form of transportation a necessity to see everything. In retrospect, we should have dished out a whopping $15 to hire a car for a day and be driven about in AC and take in all the sites without any hassle. But of course we didn’t do that. Instead we honed our skills at negotiating, haggling and just plain arguing with auto rickshaw drivers every place we went. Oh, and we were really, really hot! Did I mention it has been over 100 degrees every day? Rickshaws are certainly cheap and handy, but their drivers here in Delhi are No. One at the tourist scam business. In addition to the, “you like shopping? let me take you to a nice shop” spiel, there is also the “you have booking? I can take you to very good hotel” where of course we would pay double the price and our driver would make a nice commission. Some of the scams are quite elaborate even involving third parties making phony calls to hotels. We didn’t experience as much of this, thankfully. Whenever possible we would go to a pre-paid rickshaw booth where the price is fixed and shenanigans are fewer. But even then, we had drivers refuse to take us unless we paid double the fare. Once we got a handle on the distances and fares, we were able to drive a pretty hard bargain cutting some initial fare quotes by as much as 2/3. Even at that, these guys are making more money than if they used the meter. Oh how I long for a DC cabbie right now! Despite the chaos of Paharganj and the ongoing overcharging and extortion of rupees by just about anyone selling anything to us, Delhi is full of enough amazing sites to please any tourist. After a day of errands (changing plane tickets, buying really cheap antimalarials, drinking really good coffee), we spent time at Sarojini Nagar Market where Dave had an authentic on the sidewalk haircut, visited Humuyan’s Tomb, ate yummy cookies at Khan’s Market, found a moment of peace at the Baha’i Lotus Temple, cooled off in the shade at India Gate, marveled at the Red Fort in Old Delhi and visited birds on the mend at the Jain Bird Hospital. When we first arrived, one of the men at our hotel said, “two or three days is enough time in Delhi. very loud. very busy.” I guess he was on to something. Delhi is a great place to visit. I highly recommend it. But after a few days here, it makes me want to curse at the people in the streets around me and clothesline honking drivers right off of their motorcycles with my arm. Completely inappropriate urges and emotions I haven’t felt since we began our travels over three months ago. So to preserve our affections for India and its many splendors, we will shove off to hopefully cooler and slightly less chaotic pastures tonight.